Did you receive a promotional code to Online Domain Tools and you do not know how to use it? It is simple. What Is Online Domain Tools Promotional Code? It is a unique code in format ODT-Pxx-xxxxxxxx, which you use to activate an Online Domain Tools subscription or a credit package. You can use each promotional code only once and it may be associated to a specific user name (email address). Copy your promotional code to the Promotional code field. Fill in other registration fields and complete the registration process (requires email verification). Once you log in to your account, your newly registered account will have the promotional code’s product activated. 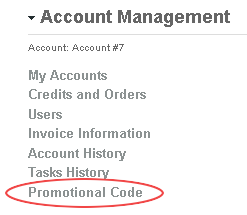 In the Account Management menu on the right side, click Promotional Code. Copy your promotional code to the Promotional code field and click the Activate button.